Toronto, Canada / TheNewswire / January 24, 2019 - Savary Gold Corporation (TSX-V: SCA) ("Savary" or the "Company") is pleased to announce additional positive drill results from a 5,266 metre, 67-hole program that included, diamond drilling, reverse circulation and air core, that was completed in November and December, 2018 on the Companies' Karankasso JV Project in southwestern Burkina Faso. Significant gold mineralization was successfully discovered at eight exploration targets and at four of the known zones with current estimated mineral resources. All of the targets and known zones remain open along strike and to depth. Follow-up drilling is warranted with a focus on increasing the total resources of the project. A summary of select drill hole results are presented below (see Figure 1 for general hole locations and Table 1 for drill intercept details). "The 2018 programs focussed on the expansion of the current resources, as well as the discovery and development of new targets, especially along the southwestern edge of this 47km long property. This work has further expanded the number of zones that we believe have reasonable potential for the definition of additional mineral resources. Now we have eight, new, dominantly oxide, developing resource targets, varying from 100 metres to 1,200 metres long, that are open to expansion. It is also great to see an increase in the number of higher-grade intercepts in the recent program, especially a new +100 gram*metre intercept. After our recent equity financing, we are well positioned to follow up on these targets during the 2019 campaign that has just commenced with a view towards completing a resource update in late 2019." The Karankasso JV project is situated in the southern part of the Hounde belt where current exploration programs are being carried out by Semafo, Teranga, Iamgold and Sarama Resources. These exploration programs are targeting the possible southern extension of the favourable package of rocks that host the operating mines to the north, that are owned by Endeavour, Semafo and Roxgold. Since January 2018, Savary has completed 25,761 metres of auger, air core, reverse circulation and diamond drilling. Savary owns an approximate 75.2% deemed interest in the Karankasso JV at year-end 2018 and is the operator of the project. The recent phase 3 drill program again focussed on the southern concession block. It comprised 40 air core holes for 2,005 metres, 15 reverse circulation holes, totalling 1,553 metres and 12 HQ core holes totalling 1,707.5 metres. The goals of the program were to expand the extent of known and new zones in order to delineate sufficient new, modelled gold mineralization to support an update of the project's mineral resources in 2019 and to continue to de-risk the project through the collection of a more complete suite of metallurgical samples of the principle zones. Karangosso South Area - One additional lens of near-surface gold mineralization was intersected returning 29.00 g/t gold over 2 metres. As well, a single core hole, drilled for metallurgical samples and geological information, returned 6 mineralized intervals, two of which, do not appear to extend to surface. The remaining 4 intervals correlate with near surface intercepts and now demonstrate that gold mineralization extends to up to 130 metres below surface. These intercepts, in descending order down the hole, comprise 0.42 g/t gold over 5.5 metres from 105 metres, 1.47 g/t gold over 1 metre from 129 metres, 2.22 g/t Au over 4 metres from 143 metres, 5.64 g/t Au over 2 metres from 165 metres, 1.12 g/t Au over 3.38 metres from 173.6 metres and 3.12 g/t gold over 3 metres from 183 metres. A total of 10 additional AC holes were drilled in the Karangosso South area to test for additional gold mineralization in drill fence gaps and complete a 300-metre step-out to the north; these holes locally returned narrow, lower grade intercepts to 0.72 g/t Au over 2 metres. Additional drilling is required, especially in the northern half of the Karangosso South Trend. Additional gold mineralization, including 12.74 g/t gold over 5 metres, was intersected 300 metres to the northeast, on strike of the Karangosso Zone. A follow-up hole, 55 metres down dip, intersected 5.45 g/t gold over 1 metre. Both of these holes were drilled to follow-up a 2017 hole that returned 2.1 g/t Au over 3 metres and that ended in strongly sericite- and carbonate-altered intermediate volcanic and anomalous gold mineralization. Additional holes are planned to test this mineralization along strike. Sera West A Zone - mineralization has been traced for 700 metres along strike and to a depth of approximately 100 metres. This zone has a current inferred1, open-pit constrained resource estimate of 19,300 ounces at 1.5 g/t gold (along the previous 400 metres of strike). Recent holes have returned some of the best intercepts to date including a core hole that returned 37.64 g/t gold over 4.2 metres and an AC hole that returned 4.55 g/t Au over 7 metres, with the latter intercept outside of the current pit constrained resource. The previous best hole from this zone returned 2.55 g/t gold over 14 metres. The high-grade core of this zone plunges 10 to 15 degrees to the north. One additional hole that tested near the south end of the zone, returned 0.73 g/t Au over 9 metres. Additional holes will target the down plunge extension of the higher-grade zone and continue to target the strike extents of this gold mineralization. A South Zone - The recent drilling indicates that this zone does not extend to depth at the northern portion of the zone, but may plunge to the south where further testing is required. Two holes at the south end of this zone, which has now been traced for 300 metres along strike, returned a shallow intercept of 2.29 g/t gold over 2 metres and a deeper, narrow intercept of 4.10 g/t gold over 1 metre. Serakoro West D Zone - This zone initially comprised the 200-metre-long D South and 400-metre-long D Mid Zones. Recent drilling demonstrates that these two zones are connected and now have a combined strike length that doubled from 600 metres to 1,200 metres. In-fill drilling is required to trace this shallow- to moderate-east-dipping, shallow-north-plunging lens to approximately 100 metres depth and along strike. Saprolite or oxidized rock extends to approximately 70 metres vertical depth. Serakoro West North area - Drilling has defined, four, new, 200-metre-long, open-ended, near-surface shallow- to moderate-east-dipping zones of gold mineralization, SWN-A, SWN-B, SWN-C and SWN-D Zones. These four target areas have been tested by three to seven holes. A fifth area will be added to the zone list if follow-up drilling can extend the gold mineralization further along strike. The SWN-A Zone returned a best intercept of 1.14 g/t gold over 13 metres and lies in a similar structural position, along the eastern edge of an approximately 17 km long felsic intrusion, as the Sera West A, Sera West A South and SWN-C Zones. Other holes, that have tested this contact corridor, generally return anomalous to strong gold values. The SWN-B Zone has only been tested by three holes to approximately 50 metres depth. The best hole returned 2.44 g/t gold over 13 metres with a hole 100 metres to the north, returning 3.28 g/t gold over 3 metres and 1.4 g/t Au over 2 metres and a hole 100 metres to the south returning four intercepts (0.82 g/t gold over 3 metres, 1.61g/t Au over 5 metres, 1.27 g/t gold over 7 metres and 1.32 g/t gold over 2 metres). A total of seven holes have been drilled to test the SWN-C Zone to approximately 70 metres depth with the two best holes returning 2.5 g/t gold over 8 metres, in the centre of the zone and 2.23 g/t gold over 6 metres in the southern most hole. It is suspected that this zone has a shallow plunge to the north as the deeper hole returned low gold values. Only three holes, within 25 metres have tested the SWN-D Zone. Better intercepts include 3.84 g/t gold over 4 metres and 2.35 g/t gold over 2 metres in the middle of the zone and 1.84 g/t gold over 6 metres at the north end of the zone. Kien East Zone - Three core holes were drilled into the Kien East Zone in order to collect fresh metallurgical samples and to test for extensions to the known mineralized zones. All three holes intersected mineralized zones where expected with extensions to the block modelled mineralization intersected in hole DH-18-01 with a lens KA1/KB intercept of 0.92 g/t gold over 19.3 metres and in hole DH-18-02A with a near surface lens KF intercept of 5.27 g/t gold over 4.7 metres and a KH lens intercept of 3.45 g/t gold over 1.4 metres. Management believes that there is significant scope in the Kien East area for increasing the overall pit constrained estimated mineral resources of 3.769 million tonnes grading 1.68 g/t Au totalling 203,900 ounces1. Kueredougou Zone - A single hole was drilled to collect a metallurgical sample and to demonstrate the potential for a higher-grade area in the deposit. This hole successfully intersected 2.26 g/t gold over 10.5 metres including 7.08 g/t gold over 2.5 metres, at the base of the current pit-constrained mineral resource confirming the potential to host a higher-grade underground resource. Diosso South Zone - A core hole, DH-10-07, at the south end of the resource, intersected close to a 100-metre-wide sericite and carbonate altered shear zone containing a mix of altered, variably mineralized, intermediate volcanics and intrusions. Four mineralized intervals, all below the base of the current estimated pit constrained inferred mineral resource, were intersected in the hole with the best interval returning 1.59 g/t gold over 7.2 metres. Two of the mineralized intervals occur to the west of the interpreted mineralized lenses and suggest the potential for additional gold mineralization within and proximal to the pit constrained inferred mineral resource. 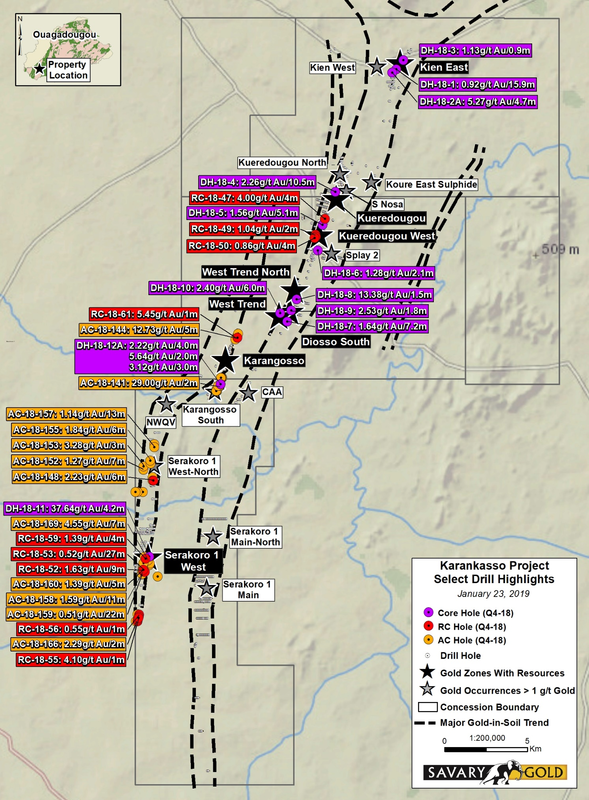 Figure 1 - Karankasso JV Project - Locations of Select, New 2018 Drill Intercepts. The 2019, US$2M exploration budget has been approved and is comprised of 5,300 metres of auger drilling, 15,700 metres of RC/AC drilling, metallurgical studies using representative fresh core samples and an updated resource estimate including a supporting 43-101 compliant technical report. Auger drilling commenced in early January. RC/AC drilling will start approximately in mid-February and will be carried out in 2 phases with an anticipated end of June completion. Metallurgical work will be carried out by Bureau Veritas in Vancouver and will commence as soon as the samples can be delivered and include up to 30 variability samples representing more than 50% of the current inferred mineral resources. An updated resource estimate is tentatively scheduled for completion in late 2019. Savary's procedure for handling reverse circulation drill chips comprises initial riffle splitting of the rock chips from one metre drill length samples into approximately 2.0-kilogram samples, as well as description and logging into a database. A duplicate 2.0-kilogram sample, prepared at the same time as the assay sample, is kept as a reference for each sample. HQ-size core assay samples are first logged into a database and then are sawn in half and then sawn in half again with a quarter of the core submitted for analysis; the length of the core samples depends on logged geological controls with samples varying from 0.3 metres to 2.5 metres in length. The remaining sample is kept in core boxes with a portion (quarter- or half-sawn core collected for metallurgical testing). A sample duplicate and assay blank was inserted sequentially every 5 to 14 samples and an assay standard was inserted every 29 to 34 samples. This results in 7 to 8% of the assayed samples being Savary inserted, reference/blank/control samples. Blanks and duplicates were preferentially inserted in visually mineralized zones to better test the assay results. This sampling procedure was periodically reviewed by Savary's President and CEO, and the Company QP, Don Dudek, P. Geo. All assay samples were collected at site by staff and delivered to BIGS laboratory in Ouagadougou, Burkina Faso where sample preparation and analysis were performed. Each sample was dried, crushed to 75% passing 2 mm and then split to 1.5 kg by rotary splitter. This split was pulverized to 85% passing 75 ?m. Fifty grams of the pulverized material was analysed for gold via fire assay with an atomic absorption spectroscopy (AAS) finish. BIGS institutes a full Quality Assurance/Quality Control (QA/QC) program consisting of insertion of internal blanks, standard reference material, repeats and reject splits which in total account for up to 25% of all determinations conducted. Most standards and blank control samples returned results within expected ranges. Those batches that returned standard values outside an approved range have been re-assayed with minor changes to assay composites. Savary is a Canadian exploration company focused on exploring and developing the Karankasso Gold Project in Burkina Faso. The Company holds an approximate 75.2% deemed joint venture ownership at year end 2018 and is the operator of the Joint Venture. The Project is located within the Hounde Greenstone Belt, which hosts Semafo's Mana mine, Roxgold's Yaramoko Mine and Endeavor's Hounde Mine. The Project contains an Inferred mineral resource estimate (November 2, 20171) of 12.3 million tonnes (Mt) grading 2.03 g/t gold for 805,000 ounces. For additional information please visit our website at www.savarygold.com. Mineral Resources are not Mineral Reserves and do not have demonstrated economic viability. There is no certainty that all or any part of Mineral Resources will be converted to Mineral Reserves. Inferred Mineral Resources have a lower level of confidence that that applied to an Indicated Mineral Resource and must not be converted to a Mineral Reserve. It is reasonably expected that the majority of the Inferred Mineral Resource could be upgraded to an Indicated Mineral Resource with continued exploration. Quantity and grades are estimates and are rounded to reflect the fact that the Mineral Resource Estimate is an approximation. This news release may contain forward-looking statements. These statements include statements regarding the Company's intention with the Karankassso JV project, access to capital, regulatory approvals, exploration and development drilling, exploration, exploitation and development activities and successes, continuity of mineralization, uncertainties related to the ability to obtain necessary permits, licenses and title and delays due to third party opposition, changes in government policies regarding mining and natural resource exploration and exploitation, and continued availability of capital and financing,. details of the potential value growth of the JV, the upside of the property, the drill program, the company's exploration plans and the timing of results, the focus on existing drill targets and new targets and general economic, market or business conditions.These statements are based on current expectations and assumptions that are subject to risks and uncertainties. Actual results could differ materially because of factors discussed in the management discussion and analysis section of our interim and most recent annual financial statement or other reports and filings with the TSX Venture Exchange and applicable Canadian securities regulations. We do not assume any obligation to update any forward-looking statements, except as required by applicable laws. Savary Gold Closes $2.0 M Strategic Investment by Semafo Inc.
Savary Gold Arranges $2.0 M Strategic Investment by Semafo Inc.